If you're looking for a great (and cheap!) hotel in Bora Bora, CheapTickets is the best place to find them. We offer deals on the best 25 hotels throughout Bora Bora. No matter what you're looking for, we have options for you. Grab great rates on the 11 affordable 3-star hotels that are easy on the wallet without sacrificing comfort. Looking for more luxury? Try one of the 5, 4-star hotel accommodations in Bora Bora. No matter your budget needs, we've pulled out all the stops to make sure you have plenty of vacation options. Maybe you prefer to search for your hotel deals based on what each hotel offers? For example, let's say you just want to find a hotel or resort that has a pool to cool off in after a long day exploring Bora Bora. Scroll down to choose from the 11 hotels in Bora Bora that has a pool for guests. Or search for deals on Bora Bora hotels offering free wifi or breakfast, non-smoking rooms, and more! 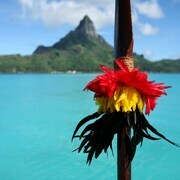 CheapTickets is here to be your personal travel agent for your next trip to Bora Bora. Get booking today! What hotels in Bora Bora offer free wifi access? Are there deals on Bora Bora hotels offering free breakfast? Yes! The only thing better than finding a great deal on a cheap hotel in Bora Bora is finding one that offers free breakfast. Grab some eggs, a waffle, or some healthy oatmeal before a day full of exploring Bora Bora and all that it has to offer. Below are just some of the many hotels that offer free breakfast in Bora Bora. Bora Bora Pearl Beach Resort and Spa is a 4.50 star rated hotel property in Bora Bora that offers free breakfast. Sofitel Bora Bora Private Island is a 4.50 star rated hotel property in Bora Bora that offers free breakfast. Sofitel Bora Bora Marara Beach Resort is a 4.00 star rated hotel property in Bora Bora that offers free breakfast. Any good rates on Bora Bora hotels with restaurants? Absolutely. Don't want to deal with planning our all your meals on your trip to Bora Bora? We don't blame you. Keep the hangry away by staying in one of the 12 hotels that have restaurants. With a room at one of these spots, all it takes to get a good meal is hopping in the elevator. Check out some of the most popular hotels in Bora Bora that have restaurants below. Book InterContinental Le Moana Resort Bora BoraInterContinental Le Moana Resort Bora Bora is a 4.00 star hotel and has one or more restaurant options. Book Blue Heaven IslandBlue Heaven Island is a 3.50 star hotel and has one or more restaurant options. 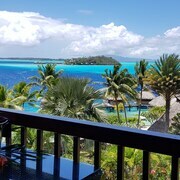 Book InterContinental Bora Bora Resort and Thalasso SpaInterContinental Bora Bora Resort and Thalasso Spa is a 5.00 star hotel and has one or more restaurant options. Book Sofitel Bora Bora Private IslandSofitel Bora Bora Private Island is a 4.50 star hotel and has one or more restaurant options. What are the cheapest hotels in Bora Bora with pools? What's better after a long day exploring Bora Bora then a relaxing dip in a pool? Finding the Bora Bora hotel you need for a bargain! Cool off and unwind at one of our 11 Bora Bora hotels with a pool. Browse some of the top deals on these hotels and resorts with pools in Bora Bora below, but be warned: You may not want to check out! Le Meridien Bora Bora has a pool and a 5.00 star rating. InterContinental Le Moana Resort Bora Bora has a pool and a 4.00 star rating. Bora Bora Pearl Beach Resort and Spa has a pool and a 4.50 star rating. Four Seasons Resort Bora Bora has a pool and a 5.00 star rating. What hotels in Bora Bora offer parking for guests? Once you've made your way to Bora Bora, the last thing you want to deal with is finding parking close to your hotel. Avoid the hassle of parking around the block and carrying your luggage all the way to the lobby by booking one of our hotels with parking. Check out deals on some of the 4 hotels in Bora Bora that offer parking for guests. Sofitel Bora Bora Marara Beach Resort This hotel has a 4.00-star rating. Bora Bora Pearl Beach Resort and Spa This hotel has a 4.50-star rating. Hotel Maitai Polynesia This hotel has a 3.00-star rating. Raiatea Lodge Hotel This hotel has a 3.00-star rating. Do Bora Bora hotels offer 24-hour concierge services? When you're on vacation, things don't always go according to plan. Travel with peace of mind when you book one of our 6 hotels in Bora Bora with 24-hour concierge service. That way you know help is always phone call or elevator ride away. Try InterContinental Le Moana Resort Bora Bora. It's a 4.00 star rated hotel in Bora Bora that offers concierge services 24 hours a day. 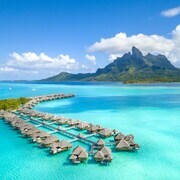 Try Sofitel Bora Bora Private Island. It's a 4.50 star rated hotel in Bora Bora that offers concierge services 24 hours a day. Try Bora Bora Pearl Beach Resort and Spa. It's a 4.50 star rated hotel in Bora Bora that offers concierge services 24 hours a day. Try Four Seasons Resort Bora Bora. It's a 5.00 star rated hotel in Bora Bora that offers concierge services 24 hours a day. What about low rates on non-smoking hotels in Bora Bora? Villa Résidence d'Hôtes Le Passage This hotel has a 3.50-star rating. 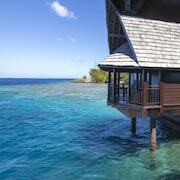 What are the cheapest Bora Bora 3-star hotel deals? Our 3-star hotels bring you quality accommodations at a lower price point for the perfect, budget-friendly vacation in Bora Bora. With 11 3-star hotels throughout Bora Bora to choose from, you still have options. Browse our selection below. Hotel Maitai Polynesia. Nestled on the beach, this Matira resort is within a 15-minute walk of Matira Beach and Coral Gardens. Leopard Rays Trench and Matira Point are also within 15 minutes. Villa Résidence d'Hôtes Le Passage. This Tahaa resort is on the beach, 2.6 mi (4.2 km) from Fa'a'aha Bay, and within 9 mi (15 km) of Ha'amene Bay and Hurepiti Bay. Oa Oa Lodge. Located on an island at the edge of Bora Bora's lagoon, with white-sand beaches and spectacular views of Mt Otemanu, this resort is within a few minutes' boat ride of the main island. 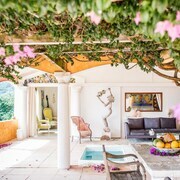 Villa Rea Hanaa. Located on an island at the edge of Bora Bora's lagoon, with white-sand beaches and spectacular views of Mt Otemanu, this resort is within a few minutes' boat ride of the main island. What are the best deals on 4-Star Hotels in Bora Bora? Bora Bora is full of hotels and it can be hard to narrow down where you really want to stay. Luckily, we've done that hard work for you be narrowing you from 25 hotels throughout Bora Bora, to the 5 4-star hotels in Bora Bora. 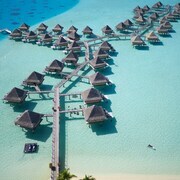 Our 4-star hotels in Bora Bora are exactly what you need for your next family trip, romantic weekend, or solo getaway. Check out our most popular deals below. Bora Bora Pearl Beach Resort and Spa: Located on an island at the edge of Bora Bora's lagoon, with white-sand beaches and spectacular views of Mt Otemanu, this resort is within a few minutes' boat ride of the main island. Sofitel Bora Bora Marara Beach Resort: Nestled on the beach, this Nunue resort is within 1 mi (2 km) of Matira Beach and Coral Gardens. Moti Piti Aau Beach and Leopard Rays Trench are also within 1 mi (2 km). InterContinental Le Moana Resort Bora Bora: Nestled on the beach, this Matira resort is within 1 mi (2 km) of Matira Beach and Coral Gardens. Leopard Rays Trench and Matira Point are also within 5 minutes. Sofitel Bora Bora Private Island: This Bora Bora resort offers a secluded, picture-perfect setting on its own island surrounded by a turquoise lagoon. Guests enjoy sweeping views of the water, sunset, and Mt. Otemanu. Bora Bora Airport is just a 20-minute boat ride away. What are the best activities to do in Bora Bora? Polynesian Island Full-Day Tour: Starting at just $139 per person. Polynesian Island Half-Day Tour: Starting at just $106 per person. Full-Day Fishing Tour: Starting at just $419 per person. Half-Day Fishing Tour: Starting at just $315 per person. Very beautiful!!! Staff was great!!! We went for our honeymoon and absolutely loved everything about this resort!!! Beautiful view, staff was great and the food was delicious(expensive food but we were prepared for that ). right on the water. can snorkel from room. I stayed here for about 12 days. by the 7th day I was ready to leave. I tried several times to contact someone at cheap tickets to no avail. I also called my phone/internet provider to help me because for calls from Bora Bora to a 1-800 number are not allowed to cheap tickets. it was paradise mostly. by the 7th or 8th day, beetles come. geckos are also in the room and lived behind the painting and up in the rafters. if you don't mind that part, its alright. definitely worth the money but it is not, a 4 star hotel. NEEDS MORE ENGLISH SPEAKING STAFF AND better amounts of currency on hand.